Here's a High Quality Autoresponder Messages Series that's ready to go! It comes with 5 High Quality and lengthy Messages, with over 3900 words. The quality of these messages will keep your subscribers reading each and every message, looking forward to the next. Messages are pre-formatted to 65 characters so it's easy to set up. Simply add your money links, copy and paste the messages in your AR series and it's ready to work on auto-pilot for you! This one comes with everything. You will also be getting a well done Squeeze page and a conformation page. Add your opt-in form, your download link, upload the web pages and the system is ready run. Teach Your Customers and Subscribers Basic List Building Strategies That Can Be Used To Build Their Own Lucrative Mailing Lists"
Did you know that email marketing is fast becoming an important part of running a successful business online and offline? It has many benefits. For instance, it is a great way for businesses to keep in touch with their customers and increase revenue at the same time. It also provides business owners with a way to connect and build solid relationships with their customers and prospects. But the simple fact is most business owners don't realize that it can play a very important role in their overall marketing plan, so they never take the time to learn how to build a mailing list and use it effectively. Did you know that many online and offline business owners make virtually all of their income just by building a targeted mailing list and sending email to it a few times a month? 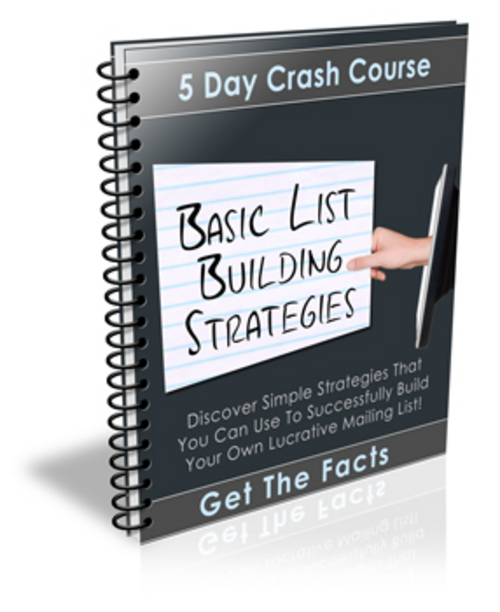 The "Basic List Building Strategies" Crash Course was specifically designed with beginners in mind, so even if you've never built a mailing list before, you will discover how to quickly attract new leads and collect email addresses like a pro! You can also use it to educate your members, subscribers and as a lead generating tool to get more traffic to your own website. As I mentioned above this short course is designed with beginners in mind, so even if you or your readers don't know the first thing about building a list of eager subscribers, you will be able to quickly teach them the basics strategies they need to know to build their own lucrative mailing list and use it to promote their own products and services! The best part is with the private label rights to this course not only will you be able to learn the ins and outs of basic list building for your own business, you will be able to pass that knowledge on to your subscribers. You will be providing them with quality information that will help them understand the basic strategies involved in building their own profitable list and how they can use it to their advantage. With this course you will providing 5 quality lessons full of solid information that you and your subscribers can start using to immediately impact your business! The "Basic List Building Strategies" Crash Course package contains everything you need to start using and selling it right away! Remember, this short course comes with resale rights so you can edit this entire course and use it for yourself or package it up and sell it and keep all the profits! You learn things like: Exactly what building a mailing list can do for your business along with two basic, yet extremely effective strategies that you can start using right away. PS. Don't forget that I've included the .psd files for all the graphics, so you can change the look and feel of the course to your liking.